What we just witnessed is the drama that is inherent with Bump Day. Am I happy that James Hinchcliffe and Pippa Mann have been bumped from this year’s field? Absolutely not! I’m gutted for both of them. But that it what Bump Day with actual bumping is all about. You must earn your way into the race. That’s what makes this race so special. It’s a privilege to be one of the thirty-three participants in this race. If you don’t think so, look at te faces of those who barely made it in. Still not convinced? Look at the faces of those that didn’t. 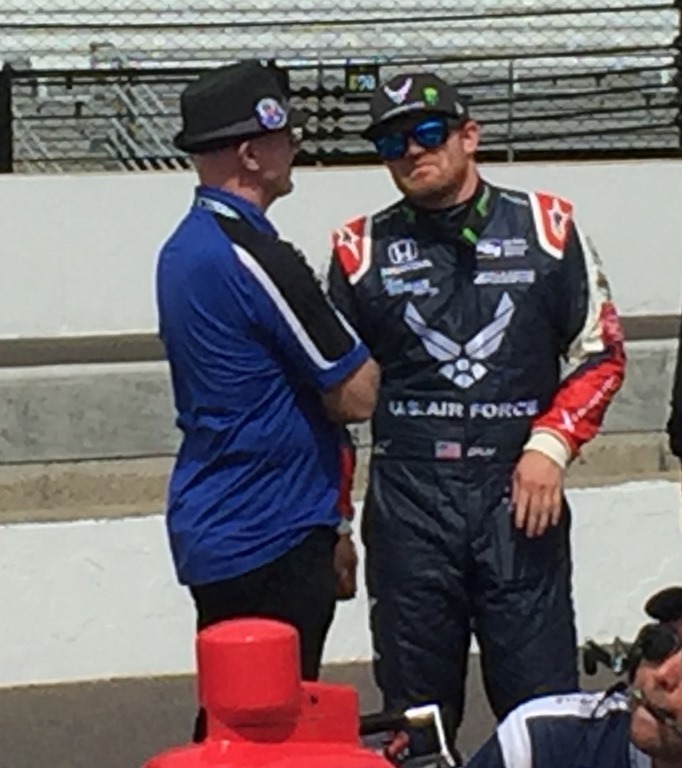 Conor Daly was in tears, hugging his family and friends after surviving being in the race, being bumped out and bumping his way back in. During the rain delay, when Conor Daly was sitting on a speed at roughly 222, I was convinced that he was going home. But give him credit for driving his way back in and making his new time stick. He was obviously relieved and overcome with emotion. That’s how much making the race meant to him. I snapped this photo just as he collected himself to be interviewed on local television. 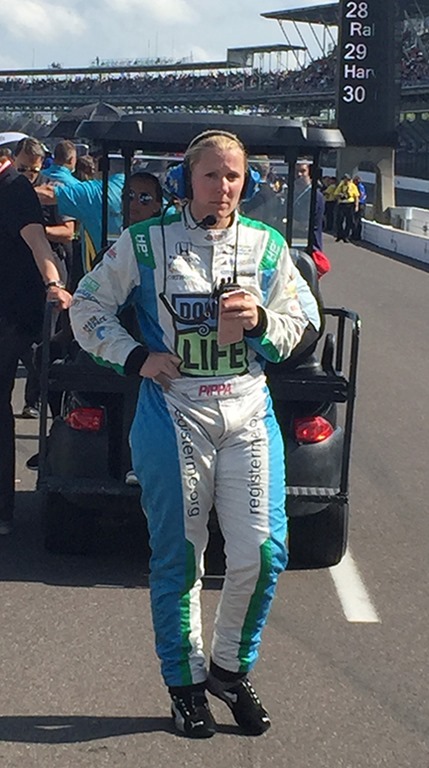 On the other end of the spectrum were Pippa Mann and James Hinchcliffe. 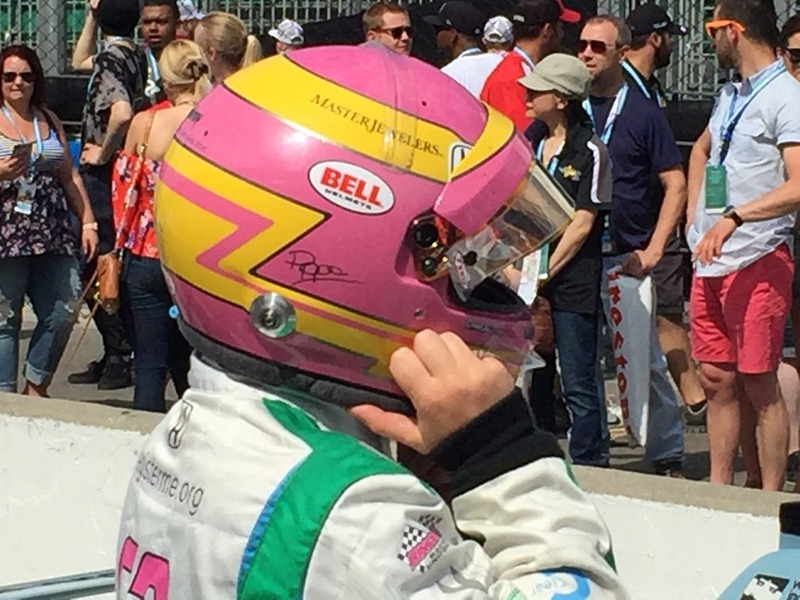 Obviously, Hinchcliffe not making it in was a bigger shock than Pippa Mann – but that doesn’t make it any more shocking for Pippa. This is her one race per year that she aims for. You knew that the one-offs were the most vulnerable to be bumped and you wondered which it would be. I’ll admit, I thought Pippa would be safe. But her body language said otherwise. As we saw her throughout the day, she seemed exceptionally nervous and frustrated. I caught her getting her helmet on before her first run, but Susan caught a photo her as she was waiting to get back in line shortly before she was bumped. She obviously knew she had reason to be nervous. My heart goes out to her as I know she is devastated. 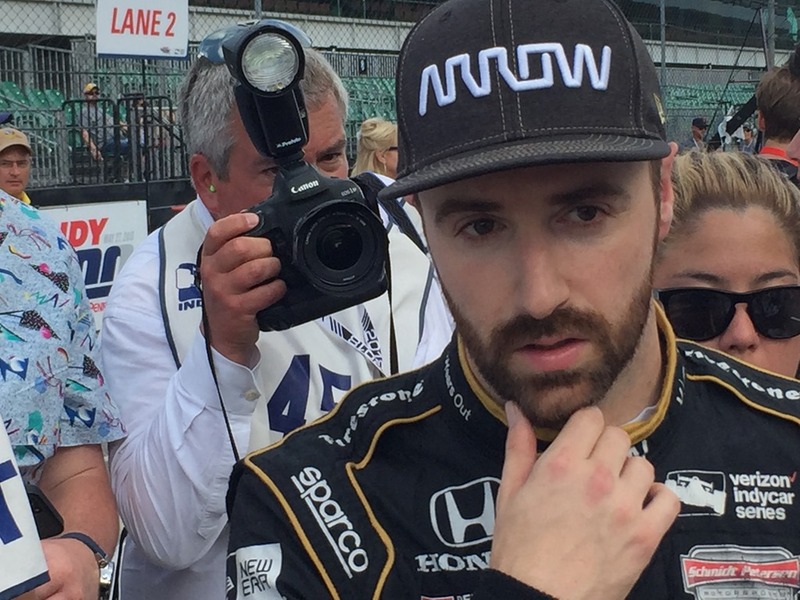 The shocker of the day, and perhaps of the year, is that James Hinchcliffe was bumped and could not re-qualify. He was initially on the track when the first rain shower came, so he had to abort his run. When the track re-opened, he was the first one out on a green track. His speed of 224.784 mph did not hold up. He went back out in the closing hour, only to pull off with a vibration. He never got back out. 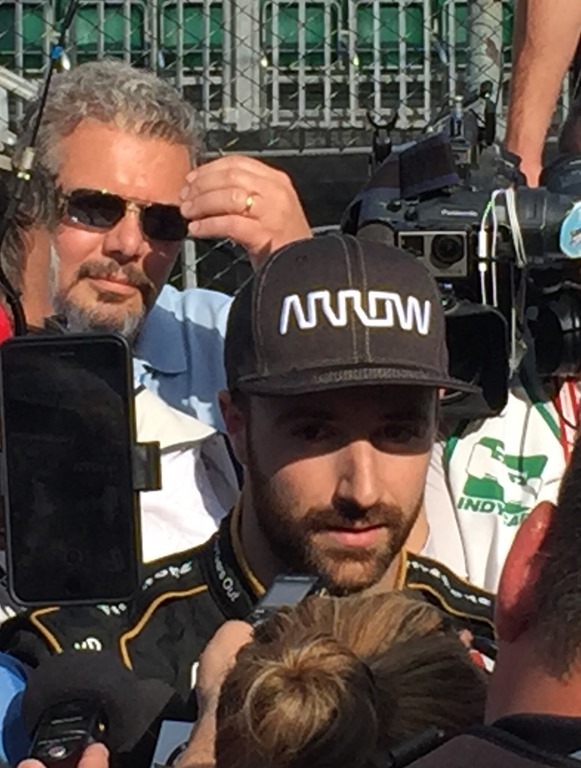 Although stunned, Hinchcliffe faced all of the questions that were thrown at him. He faced the music and didn’t flinch. Still you could see the hurt and disappointment in his eyes. I got a couple of shots as he faced the media just after climbing out of his car. 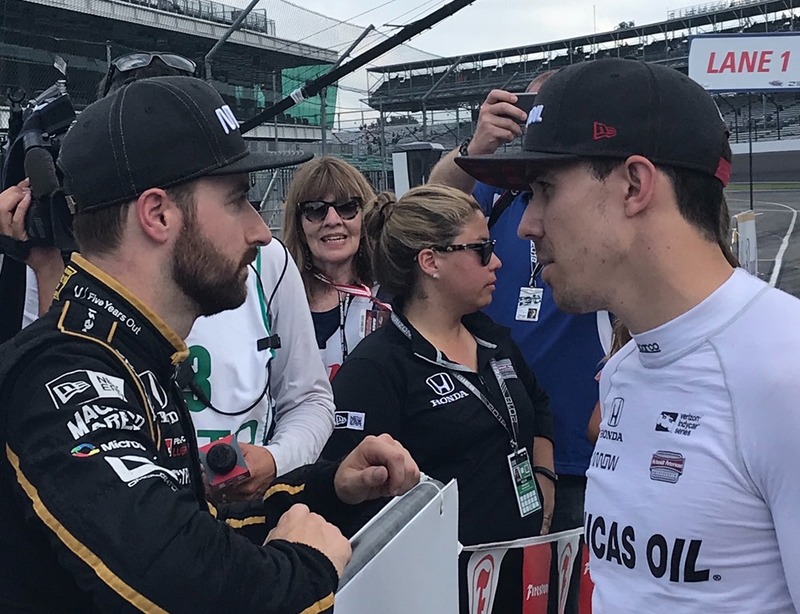 Then Susan caught the moment when he and his best friend and teammate, Robert Wickens, offered his support. 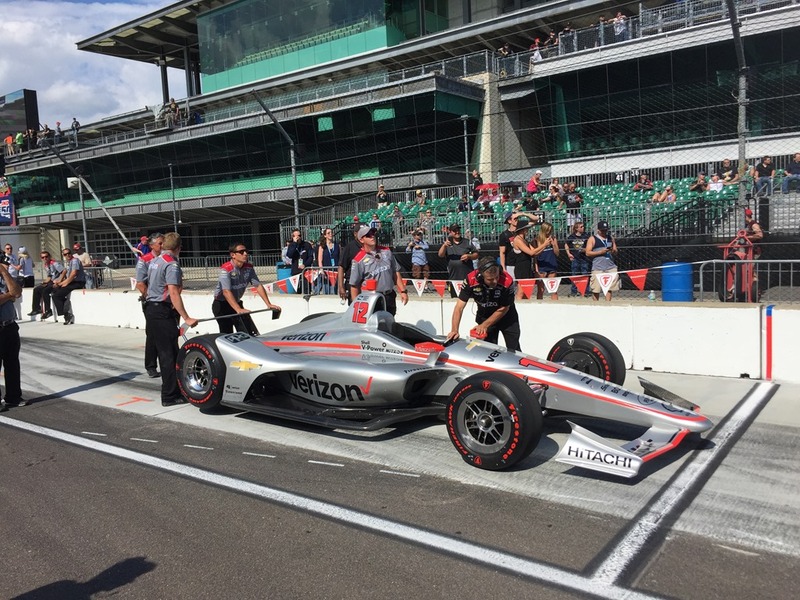 Of course, there is great speculation that Hinchcliffe may step into the qualified car of Jay Howard, his one-off teammate. I have mixed emotions about that. I didn’t like it when Michael Andretti bought the qualified car of Bruno Junqueira for the bumped Ryan Hunter-Reay in 2011. But this would at least be within the team. 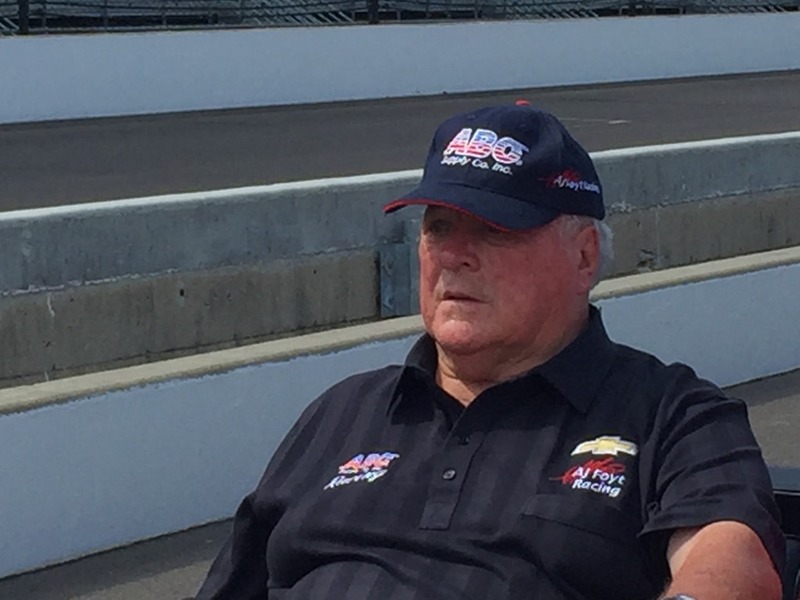 Stay tuned as Sam Schmidt makes that call. Give both bumped drivers credit. 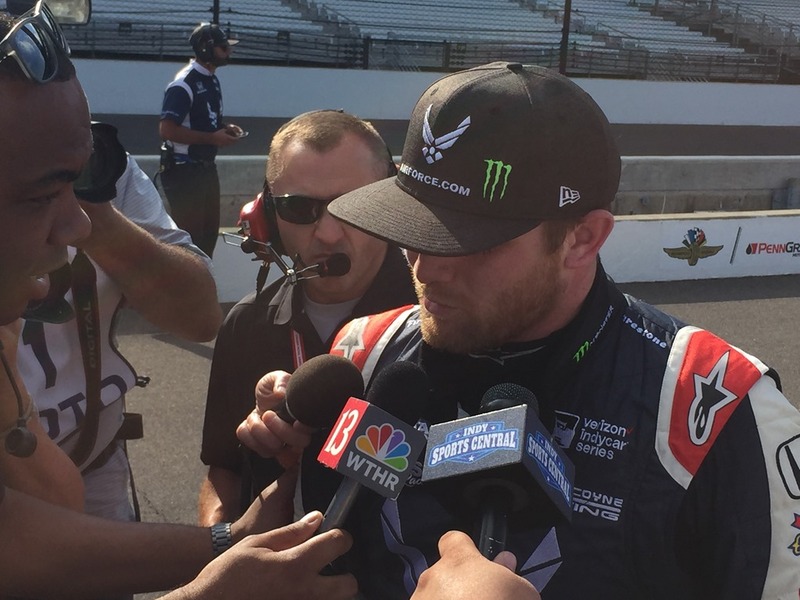 They came to the IMS Media Center on Saturday evening and faced the media. 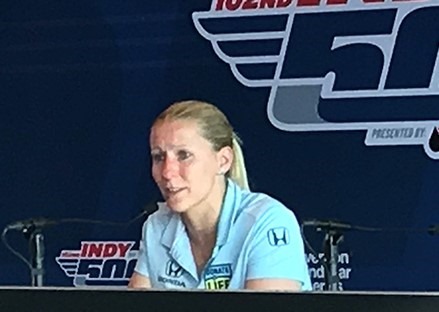 While Hinchclffe was matter-of-fact and took full responsibility for failing to make the race; Pippa Mann gave such an emotional address to the media, you could have heard a pin drop. Kudos to both drivers for the classy way they handled themselves in a tough situation. So, tomorrow the remaining thirty-three drivers will qualify for position. Those that did not make the Fast Nine will qualify knowing that the best they can do is tenth. 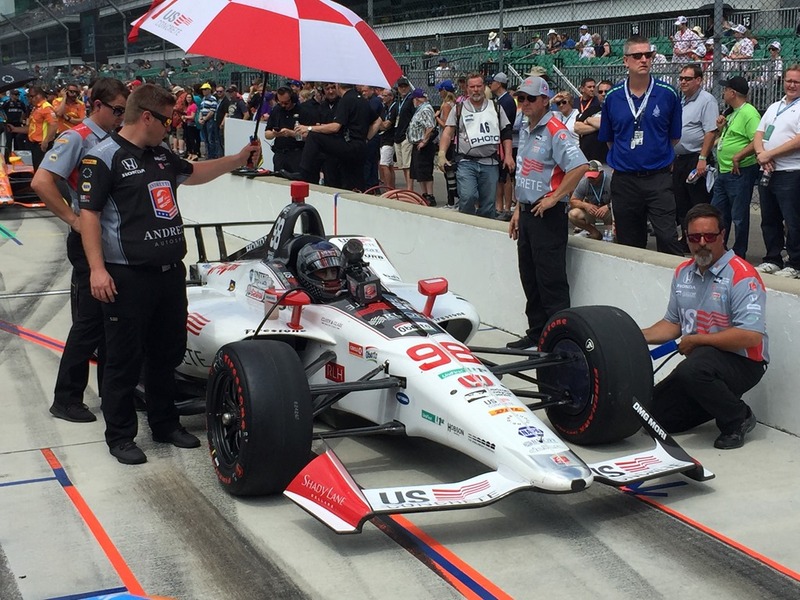 Late in the day, the Fast Nine consisting of Helio Castroneves, Ed Carpenter, Simon Pagenaud, Will Power, Sébastien Bourdais, Spencer Pigot, Josef Newgarden, Scott Dixon and Danica Patrick – will fight for the pole. That will do it for today. Susan still has a few touches on her post, but promises to have it early tomorrow. In the meantime, here is a collection of random photos that Susan and I took today (along with a video I got of Alexander Rossi starting his qualifying run). 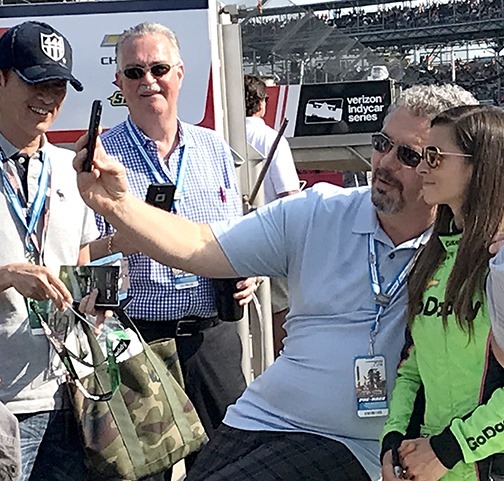 Among the photos we got are Conor Daly chatting with his father, Derek Daly; Max Chilton’s wife Chloe; a happier press conference with some of the Fast Nine; Danica Patrick psing for a selfie with a fan; Helio Castroneves chatting with Tony Kanaan and his wife Lauren in the pits and others. We will be back here to do it all again tomorrow. Thanks for following along today and enjoy the photos. 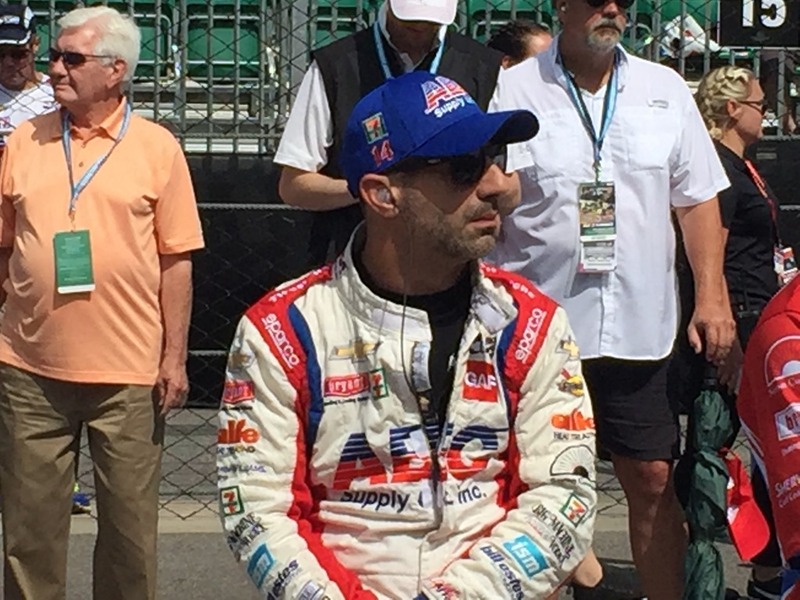 This entry was posted on May 19, 2018 at 6:55 pm and is filed under Indianapolis 500. You can follow any responses to this entry through the RSS 2.0 feed. You can leave a response, or trackback from your own site. End of today interesting side-note on one of the wheels from Hinch’s car and Firestone’s activity, as relayed in the TrackForum web site. 8:28pm Saturday May 19th From Dominato83 Trackforum.com: “My dad was in the garages when the team got back. He got a first hand view of a very excited Hinch crew member yelling at a Firestone rep and then shaking the tire at fault. There was a clear rattle during that. The tire was taken apart by Firestone and the offending part was placed in a bag and taken away. My dad tried to figure out what it was but neither the Hinch guys nor the Firestone people would say what it was. Thanks for the reports George. I think the format needs tweaking. Drivers desperately trying to get in and you have another line attempting to improve position while already safely in. Leaves a bitter taste. Would have been a dramatic last effort with Hinch out there. This day’s intensity reminded me of the fourth day of qualifying back in the 70’s and 80’s. A big difference now is that there is still position qualifying to do tomorrow and, after today, that me seem quite anti-climatic to many. I suggest going back to the way qualifying was done back then, just with the two day format. The problem today with this format is it was designed for a 33 car on l y field. Some unintended consequences happened today because of this. He is all that. but the Greatest Spectacle In Racing is that exactly because of moments like this, not in spite of. 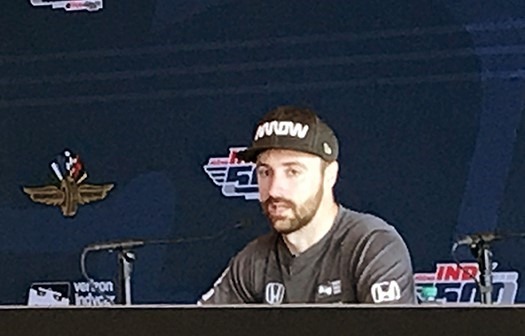 “Explaining his failure to qualify in more detail, Hinchcliffe says the team has identified the cause of a big vibration that forced him to pit before starting what turned out to be his final attempt. It’s a shame Hinch did not make the field. His team dropped the ball by not getting that car back in line at the right time.Hinch himself said it was no one’s faught except there own. It was a tire senor that was inside the tire. The race is better for bumping, you must earn your way in period. Hinch was a stand up guy yesterday took it like a man. Some of his fans are upset and want to change everything, we’ll as Hinch said if you feel that way ,you don’t know motorsports, keep your mouth shut. If the field is extended to 35 I will be very discouraged. Is this still a competition or does everyone get a pass? I am very disappointed to say the least. Why wasn’t time added after two hour delay due to rain? 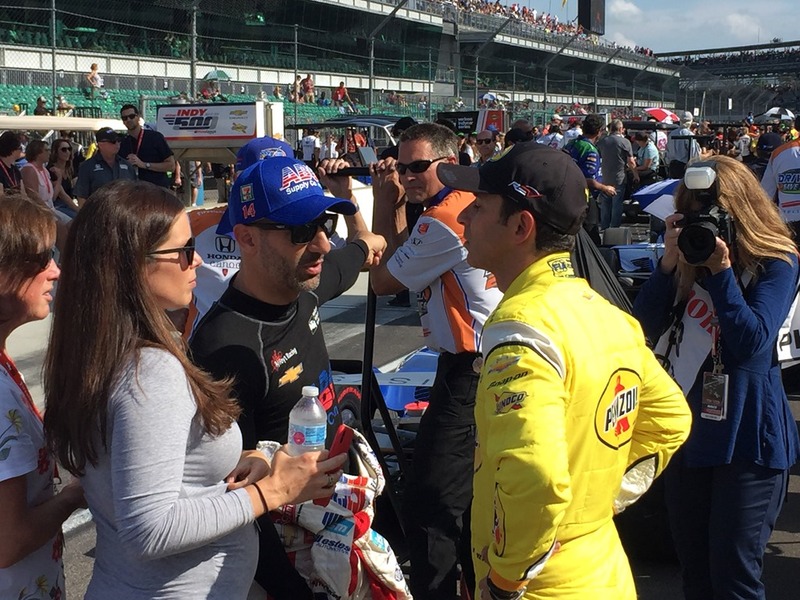 On the other hand I wondered by SPM didn’t have Hinch in line right away with Servia and Conor, so he could better his time. Very unfortunate.